In the past two years, I have really made an extra effort to see works-in-progress. Whether in a rehearsal setting, in a previewed excerpt or at an informal showing, I have come to realize that these opportunities are invaluable. Critics are with choreography for such a short duration - even if you see the same piece multiple times, the cast, staging or venue are likely to be different, thus, making the piece different too. Being present for the process of dancemaking is such a different experience; an intimate gift that provides unique insight that the finished product alone may not. 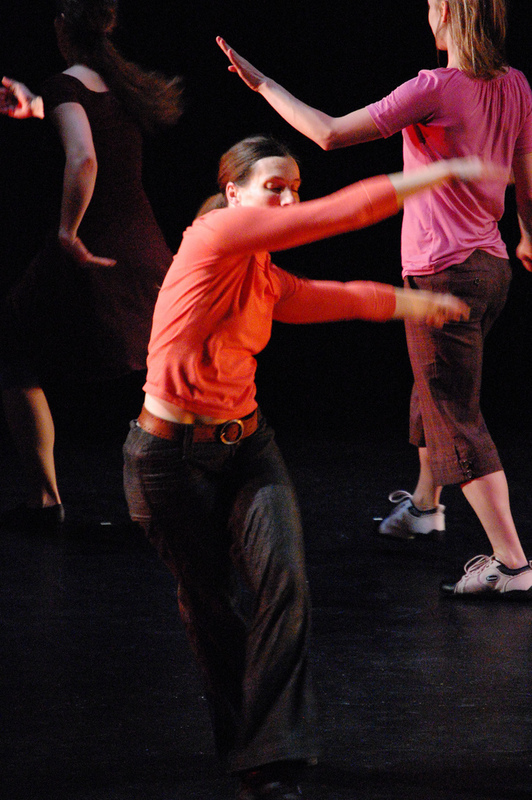 The "Works in the Works 2010" program offered the chance to see five dances at various stages of growth: "H₁" (Abigail McNally/A Mused Collective), "My Hands/Tus Brazos" (Linda Bair Dance Company), "Banksy's Children" (MeND Dance Theater Company), "What Is It About Memory?" (Jetta Martin), and an untitled work performed by the San Francisco State University Dancers, choreographed by Ray Tadio. The breadth, diversity and quality of the work is something that all the choreographers (and this long-running festival) should be proud of. I did have favorites among the group, the first being Linda Bair's "My Hands/Tus Brazos", a modern piece that delved into the reality of a relationship, emphasizing the dramatic and less-happy interactions that we try so hard to hide. We saw Bair and partner Jorge Luis Morejon (both seasoned performers) running around each other, forcing affection, and controlling movements and reactions. Though the angst was predominant in the duet, there were also instances of tenderness, particularly a number of cantilevered, off-balance poses which could only be accomplished through communication and working together. My only critique of the work is that we were told prior to the dance what it was about and what the choreography was trying to say. This wasn't really necessary; give the audience the chance to reach its own conclusions. Another highlight (for me, at least) was Ray Tadio's untitled work. At first, this piece seemed abstract, though as it continued, I came to wonder whether Tadio was examining how one's physicality changes as others are present or absent in their space. His experimentation with the number of dancers in each segment led to this question: solos versus partnered duets and solos juxtaposed with spatial duets. It really seemed to be a comment on personal awareness. All seven of these young performers were amazing, and it was so great to see compelling stage presence and strong technique from a variety of body types. Having said that, the group does need to work a little more on the fluidity of their partnering lifts. The women have the core strength to hold any position and the appropriate preparation to achieve height and ballon. The men also have the muscular strength to support these complicated and intricate lifts. The problem happens when the two meet - the strength of both parties explodes a bit resulting in a 'splatty' lift. They are almost there, they just need a little more pas de deux training to maintain their individual strengths, while allowing the lift to evolve organically and calmly. Abigail McNally's "H₁" had a very unique movement vocabulary, a joining of modern with hip-hop (popping, locking and accented isolations). There were lots of bent elbows and extensions that purposely collapsed as the joints gave into flexion. The first solo dancer had adapted well to this fusion style; the other three were well-versed in the modern aspects of the choreography, but the hip-hop was a little outside their comfort zone. MeND Dance Theater Company's "Banksy's Children" blended many genres: contact improvisation and acrobatics under the auspice of dance theater. Artistic Director Grace Alvarez's conceptual framework was very clear (childhood), though she was trying to answer too many questions all at once. Perhaps each of her ideas should be the fodder for a series of single works. Unfortunately, trying to say everything often leads to an unfocused result. "What Is It About Memory?" by Jetta Martin was definitely the loveliest dance of the night. Both women in this duet (Jetta Martin and Coral Martin) are beautiful dancers and accomplished performers (technically and artistically). But, the choreography was a little predictable. The best part of the piece was the opening image: the dancers facing upstage and simply rolling their shoulders. That moment was special and it needed to be explored, but instead what followed was a number of 'ballet class' combinations. Absolutely stunning but utterly safe. Seeing dance at different points of development helps build and foster the relationship with that work. I hope I get the chance to see some of the "Works in the Works" pieces at another viewing in the future.